We are living in cruel days. Evil hours. The Bible predicted the days would come were the wicked would rise to persecute to righteous. Indeed, the Bible foretold that those trusted with great power would conspire to destroy Jesus and create a new age of Liberal Darkness. 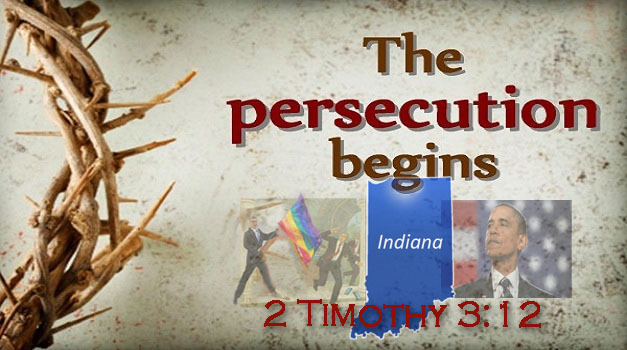 This week the state of Indiana has become a martyr, a fallen hero in the war of good versus evil. Governor Mike Pence took a bold move earlier in the week and declared Christians had a fundamental right of religious freedom. Media, businesses and politicians have conspired to make conservatives in Indiana look like the boogieman. Suddenly the nation is acting like it is a big deal to say a business is ‘Christians’ and wants their customers to hold themselves to a moral standard of conduct. Indiana’s religious freedom law is no different than any other private sector law. Businesses are allowed to enforce dress codes, noise ordinances and ‘must buy’ policies, so why not a gay code? The war on Indiana is meant to offer a final death blow to conservatives trying to make a stand for themselves. Today it is silencing Christians who want to protect the sanctity of marriage, tomorrow it is shaming anyone who would are say Iran does not have the right to build nuclear weapons and rain them down upon the heads of the innocent.